Two posts are coming up on two important DVD releases from that excellent label Edition Filmmuseum. Post number one is on an innovative two-DVD set of magic lantern slides and early films, Screening the Poor 1888-1914.
photographic and film industries delivered glass slide sets and films in very large runs on a variety of themes relating to poverty. 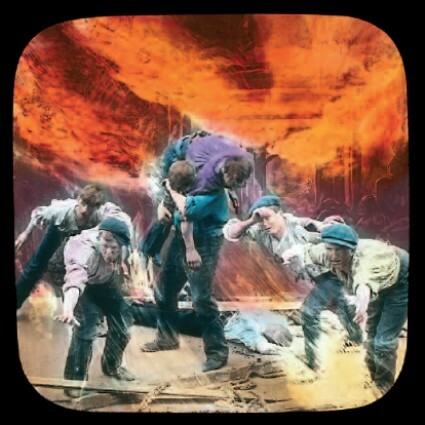 This DVD recalls the forgotten art of projection and presents it anew on the modern electronic screen: drawing on original images and using authentic projection equipment, Ensemble illuminago shows enchanting Victorian slide shows and films in a live musical performance at the Munich Film Museum. Digital slideshows reconstruct the interaction between slide sets und text recitals, and early silent films are accompanied with music as they were a century ago: piano and violin underscore the moods that find visual expression in the films. Nowadays it is rather unusual to find both films and slide sets presented on one DVD. Around 1900 it was common knowledge that the “moving pictures” in a film had evolved from photographic slide sets. Showmen, touring lecturers, music-hall entrepreneurs and cinema operators often used both projection media alternately in their live shows. Charitable organisations and dedicated journalists decried the misery of the slums in industrial cities. ‘Slumming’ was the term used to describe tourist outings or philanthropic day-trips to witness the poverty. Those who eschewed direct confrontation could visit magic lantern shows or the cinema: the photographic and film industries provided a constant supply of new material covering diverse issues of the ‘Social Question’. Magic Lantern: The Magic Wand (GB 1889). Producer: York & Son, Text: George R. Sims. Reconstructed by Ludwig Vogl-Bienek, Speaker: Mervyn Heard. – During an excursion through the slums of London, an author hears the story of an 8-year-old girl who discovers a magical way to cope with her mother’s death. 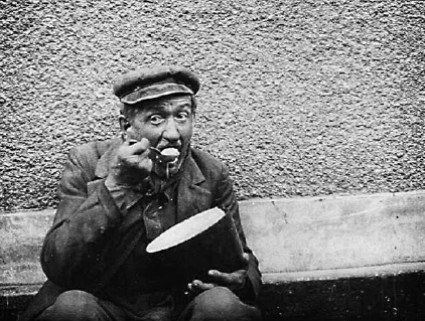 Film: Comment les pauvres mangent à Paris / How the Poor Dine in Paris (FR 1910). Producer: Pathé. Score by Günter A. Buchwald (piano) – The first film reportage about the ‘clochards’ of Paris: it is difficult to distinguish the extras acting in the film from the real homeless people. Film: Le Violoniste della carità / The Two Violonists (IT 1910). Producer: Cines. Score by Günter A. Buchwald (piano & violin) – Two elegant young ladies embark on a slumming adventure: they swap their clothes with two poor sisters and perform as street musicians in their place. Film: La Tournée des Grands Ducs / Seeing the Real Thing (FR 1910). Producer: Pathé, Director: Yves Mirande, Cast: Armand Numès, Gaston Sylvestre, La Polaire. Score by Günter A. Buchwald (piano ) – This film parodies the slumming trips made by members of Paris high society. An acting troupe satisfies the demand for entertainment by playing ‘real Apaches’. The huge number of poor children was a central issue of the ‘Social Question’. They were not to blame for their wretched situation – and their need of help was obvious. Nonetheless, they were often suspected of being petty criminals. Slide shows and film screenings, however, usually presented impoverished children to their audiences as needy creatures deserving of help and affection. Magic Lantern: Ora pro nobis (GB 1897). Producer: Bamforth, Text: A. Horspool, Music by M. Piccolomini. Live Performance: illuminago – Karin Bienek, Ludwig Vogl-Bienek, Piano: Judith Herrmann – Ignored by passing churchgoers, an orphan girl freezes to death at her mother’s grave – an appeal to the Christian duty to provide help and alms to the poor. Film: Le Bagne des gosses / Children’s Reformatory (FR 1907). Producer: Pathé. Score by Günter A. Buchwald (piano & violin) – An orphan boy flees from a correctional institution in which children aged between eight and twelve are mistreated in the manner of prisoners in a penal colony. Film: Bébé veut imiter St. Martin / Baby Pantomimes St. Martin (FR 1910). Producer: Pathé, Director: Louis Feuillade, Cast: Clément Mary. Score by Günter A. Buchwald (piano) – Cinema’s very first child star gives a freezing girl half of his overcoat and learns that half a coat is of little help against the cold. Magic Lantern: Billy’s Rose (GB 1888). Producer: York & Son, Text: George R. Sims. Reconstructed by Ludwig Vogl-Bienek, Speaker: Mervyn Heard – Death and salvation in the slums: a girl goes in search of a rose for her dying brother, but she freezes to death in the process and hands him the rose in heaven. Impoverished children were made to work as street peddlers, shoe-shines, and messengers to help support their families. The labour unions, social reformers and charitable organisations were particularly critical of the perilous conditions faced by child labourers in factories. Film: The Cry of the Children (US 1912). Producer: Thanhouser, Director: George O. Nichols, Cast: Marie Eline, Ethel Wright, James Cruze, Lila H. Chester, Text: Elizabeth Barrett Browning (1843). Score by Andrew Crow (Wurlitzer organ) – A moving appeal against child exploitation featuring highly realistic staged film footage. The story of a young girl’s death in a textile factory became a manifesto of the American reform movement against child labour. Film: The Little Match Girl – Print title: Het Luciferverkoopstertje (GB 1914). Producer: Neptune Films, Director: Percy Nash. Score by Günter A. Buchwald (piano & violin) – The young street vendor in H.C. Andersen’s fairytale The Little Match Girl (1845) is one of the most famous and enduring icons of poverty. The story of her death and salvation has inspired countless book illustrations, magic lantern shows and film productions to the present day. the benevolence shown to them. Slide sets and early films on the issue of poor relief addressed such prejudices – and also made fun of over-enthusiastic benefactors. Film: Le Chemineau / Print title: De Zwerver (FR 1905). Producer: Pathé, Director: Albert Capellani, according to Victor Hugo, Les Misérables (1862). Score by Günter A. Buchwald (piano) – A tramp who has stolen the holy silverware is acquitted. The pastor places charity before the law and claims that he had given the tramp the plundered goods. The missing scene at the end of this film can be seen on a postcard in the ROM section of this DVD. Film: Rigadin a l’âme sensible / Whiffles Has a Sensitive Soul (FR 1910). Producer: Pathé / S.C.A.G.L.,Director: Georges Monca, Cast: Charles Prince, Gabrielle Chalon, Andrée Marly. Score by Günter A. Buchwald (piano, viola & violin) – In this comedy, our sympathy is not directed at the poor, but rather at the aristocratic benefactor who cannot bear to see suffering: he hands out all of his money – and even gives away most of the clothes on his back. 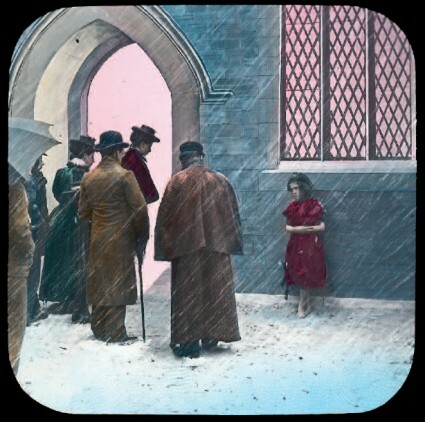 Magic Lantern: In the Workhouse (GB 1890). Producer: Bamforth, Text: George R. Sims. Reconstructed by Ludwig Vogl-Bienek, Speaker: Mervyn Heard – During Christmas celebrations at the workhouse, an old man attacks the British poor relief system: his sick wife had died of starvation the previous Christmas because the care authorities had ruthlessly stuck by their regulations. Film: Christmas Day in the Workhouse (GB 1914). Producer: G. B. Samuelson Productions, Director: George W. Pearson, Text: George R. Sims. Score by Günter A. Buchwald (piano) – In the film version of this ballad, the old man dies just as he finishes his lament. Film: Ahlbeck. Der Kaiser bei den Berliner Arbeiterkindern in dem von ihm gestifteten Heim / Ahlbeck. Wilhelm II visits a Working-Class Children’s Home (DE 1914). Producer: Eiko-Woche. Score by Günter A. Buchwald (piano) – At the Baltic Sea spa town of Ahlbeck on the island of Usedom, Kaiser Wilhelm II becomes convinced that playing in the sand of the dunes is beneficial to the recuperation of children. Alcoholism was often blamed as the cause of poverty. However, many social reformers emphasised that it was instead a consequence of poverty. In their war against the ‘demon alcohol’, the Temperance Movement relied on the persuasive power of projected images. Tales of drunken fathers who drove their families to ruin were part of the standard repertoire in early cinema and magic lantern shows. Film: Manchester Band of Hope Procession (GB 1901). Producer: Mitchell and Kenyon. Score by Günter A. Buchwald (piano) – The Temperance Movement held street parades to rally support for their cause among the local populace. Magic Lantern: Enter not the Dramshop (GB 1890). Unknown Producer. Text & Live Performance: illuminago – Karin Bienek, Ludwig Vogl-Bienek. – The pub threshold marks the crossroads between well-being and downfall: victims of alcohol are presented for purposes of pedagogical instruction. Medical diagrams illustrate the devastating effects of alcoholism on the human body. 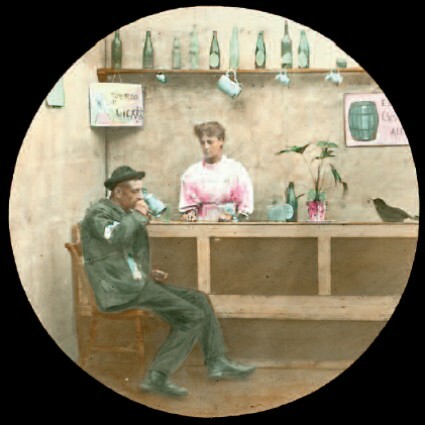 Film: Les Victimes de l’alcoolisme / Victims of Drink (FR 1902). Producer: Pathé, Director: Ferdinand Zecca. Score by Günter A. Buchwald (piano & violin) – Based on Émile Zola’s novel L’Assommoir, this film depicts the gradual decline of a labourer who starts out as a decent family man and ends up an inmate of a madhouse wracked by delirium tremens. Film: Une Vie gaspillée (Print title) / A Life Wasted (DK 1910). Producer: Continental Films. Score by Günter A. Buchwald (piano & violin). Original title not known. – A drunkard’s daughter likewise falls victim to alcoholism and freezes to death because her parents refuse to take her in. Magic Lantern: Buy Your Own Cherries! (GB 1905). Producer: Bamforth, Text: John W. Kirton. Reconstructed by Ludwig Vogl-Bienek, Speaker: Mervyn Heard – The landlady of a pub refuses a carpenter the cherries that are standing on the bar. He thus renounces alcohol, instead spending his money on his family, and starts his own business. Film: Buy Your Own Cherries! (GB 1904). Producer: Robert W. Paul. Score by Günter A. Buchwald (piano, viola & violin) – The film version foreshortens the ending: instead of continuing to drink, the carpenter buys gifts for his wife and children. Magic Lantern: Dustman‘s Darling (GB 1894). Producer: Bamforth, Text: Matthew B. Moorhouse. Reconstructed by Ludwig Vogl-Bienek, Speaker: Mervyn Heard – At the door of a tavern, a widowed dustman tells the story of how his little daughter inspired him to give up drinking. Film: A Drunkard’s Reformation (US 1909). Producer: American Biograph (US 1909), Director: David W. Griffith, Cast: Arthur V. Johnson, Linda Arvidson, Adele DeGarde, Robert E. Harron, Florence Lawrence, Mack Sennett. Score by Günter A. Buchwald (piano) – While visiting the theatre with his young daughter, a drunkard is cured of his alcoholism. By cross-cutting between the Temperance Movement play on the stage and the reactions of the father and his daughter in the auditorium, D.W. Griffith makes visible the psychological process of an internal catharsis. Poor people who were able to work received no support. The working classes were forced to take on poorly-paid and dangerous jobs in order to survive. Mining accidents spread fear and terror among mining communities. Sensational special effects on the screen, such as firedamp explosions, helped reinforce demands by the labour unions and charitable organisations for safer working conditions and improved support for surviving dependants. Magic Lantern: A Bunch of Primroses (GB 1889). Hersteller / Producer: York & Son, Text: George R. Sims. Reconstructed by Ludwig Vogl-Bienek, Speaker: Mervyn Heard – A bunch of primroses lies on the death bed of a young female worker and tells of how she blossomed in the country and met an early death doing factory work in an industrial city. Film: Au Pays noir / Tragedy in a Coal Mine (FR 1905). Producer: Pathé, Director: Ferdinand Zecca. Score by Günter A. Buchwald (piano & viola) – Mining accidents used to be part of daily life for miners: Pathé, the leading film company of the time, condemned this scandalous situation by releasing this melodramatic social reportage which was shot partly on location at a mining site and partly on a recreated set in a film studio. Magic Lantern: Don’t Go Down in the Mine, Dad (GB 1910). Producer: Bamforth, Text: Robert Donnelly, Score by Will Geddes. Live Performance: illuminago – Karin Bienek, Ludwig Vogl-Bienek, Score by Judith Herrmann (piano) – Dramatic slides illustrate a popular miners’ song: the sick son senses an impending accident and thus saves his father’s life. Magic Lantern shows and early films about the ‘Social Question’ rarely tell of a successful escape from poverty, and the elimination of poverty is not an issue. The flood of emigrants was addressed by slide sets used by charitable organisations to prepare the migrants for an uncertain future. However, other means of escape from poverty were at hand: salvation in the afterlife or in the world of fantasy. Film: The Two Roses (USA 1910). Print title: Les Deux roses, Producer: Thanhouser, Cast: Marie Eline, Frank Hall Crane, Anna Rosemond. Score by Günter A. Buchwald (piano) – Tony Prolo is a track worker, and his son is run over by a car driven by the company boss: the boy recovers and the worker’s family is given a nice new home as a gift. 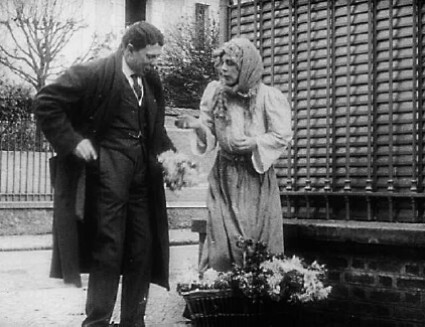 Film: Deux petits Jésus / The Foundling (FR 1910). Producer: Pathé / S.C.A.G.L., Director: Georges Denola, Cast: Jeanne Delvair, Jeanne Grumbach, Georges Paulais. Score by Günter A. Buchwald (piano) – Abandoned by the father of her child, a young mother is confronted with ignorance when she goes begging: in desperation she seeks refuge in an abbey church, lays her baby in the nativity crib – and dies. Film: Geheimnisvolle Streichholzdose / A Match Box Mystery (DE 1910). Deutsche Bioscop, Director: Guido Seeber. Score by Günter A. Buchwald (piano, viola & violin) – A man without legs sells matches: in a surprising animation, the matches group together to form a variety of forms, until ultimately a small windmill made of matches burns down. This is an excellent compilation, which illuminates the visual media of the late 19th/early 20th centuries and illuminates what concerned society and how it chose to express that concern. Like the best of the magic lantern and cinematograph shows, it imparts a strong impression upon the mind, teaching us of the sorrows of an age not so far away. I hope the DVD finds its way to new audiences.